Piermonde Apartments offer 2 or 3 bedroom, state of the art apartments in the heard of Cairns. 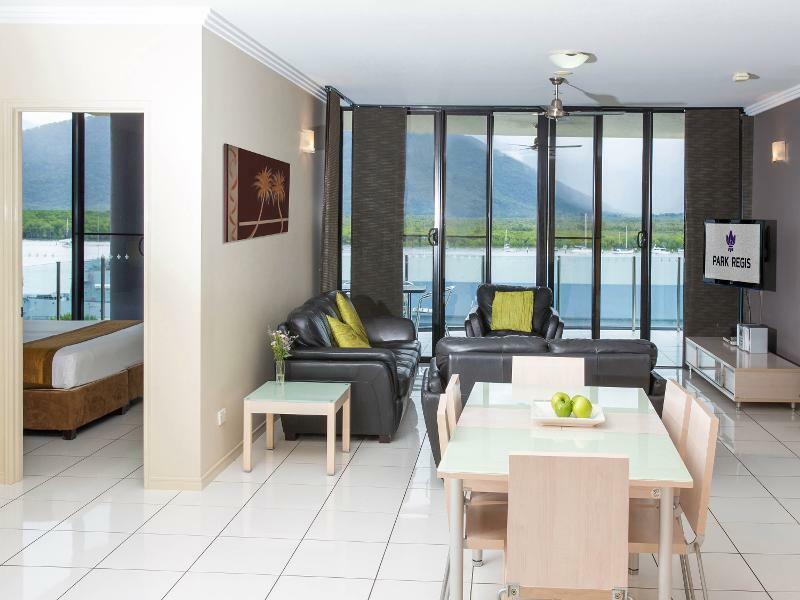 Enjoy spectacular mountain or water views on your next Cairns getaway. Piermonde Apartments' central Cairns location ensures easy access to a number of health, fitness and leisure options. Day Spas Choose one of our recommended day spas and ask our friendly staff to book you in for a treatment or massage. Hair Salons Please ask our friendly staff to recommend a hair salon nearby. Hotel Swimming Pool Enjoy the Park Regis Piermonde Apartments outdoor sun soaked spa and pool area. Fitness Centres Stay active in Cairns and visit one of the local fitness centres in the area or plan your own workout at the fitness course on The Esplanade. Meetings & Conferences Our helpful staff can assist you in booking a meeting room or conference space at the local Bolands Centre. Business Services Enquire at reception about our business services which include photocopying, faxing, courier and mailing. Discover a range of great restaurants and cafes in Cairns. Ask our friendly staff for their recommendations. Restaurants & Cafes Enjoy a meal at one of our recommended restaurants or stroll down The Esplanade and discover one of your own! Bars So many choices, so little time! Discover an array of great drinking holes in Cairns. For your venue hire and conferencing, we recommend the award winning Cairns Convention Centre. Functions + Events We can recommend the award winning Cairns Convention Centre for venue hire in Cairns. Browse through a selection of images of Piermonde Apartments. Our modern two or three bedroom apartments are the perfect environment for relaxing and unwinding. Enjoy all the modern comforts guests have come to expect from Park Regis hotels. All apartments boast huge bathrooms with spa or jet baths, full kitchen and laundry facilities, individually controlled air-conditioners, ceiling fans, complimentary Wi-Fi access with up to 1GB, work desk and most offer large balconies with sweeping views of the mountains or Cairns waterways. Largest Two Bedroom Apartment in Cairns city! Featuring modern décor, two bathrooms with spa bath, spacious balcony with sweeping views and full kitchen and laundry facilities. Rate for 4 guests. Max 5 people. Stay in one of our impressive 2 Bedroom Apartments boasting sweeping views of the Cairns Coastline. Large balconies, full kitchen and laundry facilities.